Some of the cast from the Blackadder Goes Forth comedy. Seen by many as the best of all the series of Blackadder. The final series, titled ‘Blackadder Goes Forth’ was written by Richard Curtis and Ben Elton, with Richard Boden listed as Director. The series was a brilliant mix of clever lines, cheesy jokes and a big lump of silliness. Remember the court case for the lovely, plump pigeon called Speckled Jim? The silliness and cheesy jokes were all wrapped around a storyline about Edmund trying to avoid going over the top during World War 1. The main characters were; Captain Edmund Blackadder, Private Baldrick, Lieutenant George (his full name is actually scripted as ‘Lieutenant The Honourable George Colthurst St. Barleigh’), Captain Kevin Darling and General Melchett. The key cast of actors included Rowan Atkinson, Hugh Laurie, Stephen Fry, Tony Robinson, Tim McInnerny and Rik Mayall. Here is a collection of some of the best quotes from the different characters in different episodes. 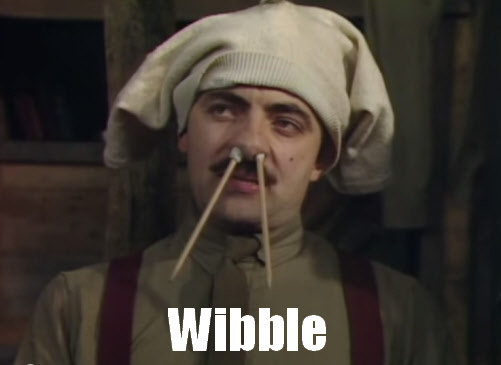 Blackadder – We’re in the stickiest situation since Sticky the Stick Insect got stuck on a sticky bun. George – I’m the last of the tiddly-winking leapfroggers from the golden summer of 1914. Baldrick – And they’ve overthrown Nicholas the Second, who used to be bizarre. Melchett – If you come back with the information, Captain Darling will pump you thoroughly in the debriefing room. Lieutenant George – Mad as a bicycle! Darling – You’d better find the real spy or Ill make it very hard for you. Melchett – Security isn’t a dirty word, crevice is a dirty word. Blackadder – So every time I have been drinking your coffee, I have in fact been drinking hot mud? George – If we should step on a mine sir, what should we do? Blackadder – So you’re a chap, are you, Bob? You wouldn’t say that you were a girl at all? Lord Flasheart – If word gets out that I’m missing, 500 girls will kill themselves. I wouldn’t want them on my conscience, not when they ought to be on my face! Darling – No sir, its the Germans we should be licking. George – Miserable slant eyed sausage eating swines (talking about the Russians). Blackadder – Permission granted Baldrick, as long as it isn’t the one about where babies come from. 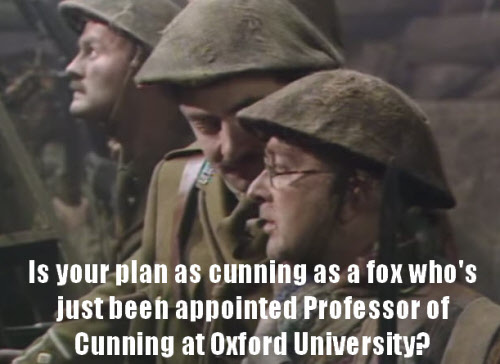 As cunning as a fox who’s just been appointed Professor of Cunning at Oxford University? There are lots of funny scenes you can watch online at YouTube. 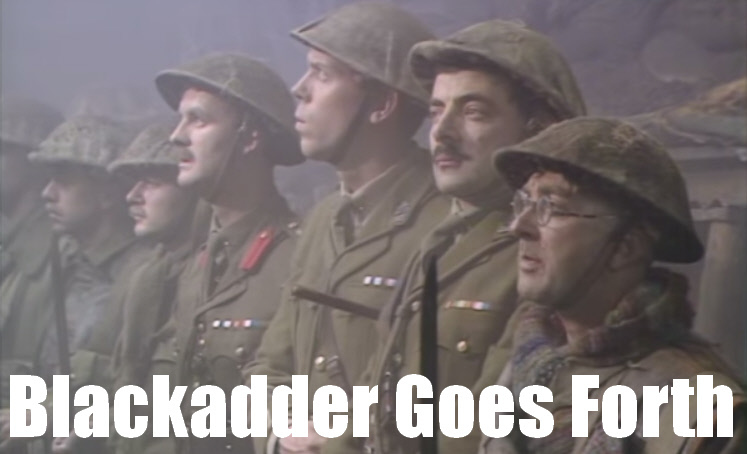 But it would only be right to have one video here, the Blackadder Goes Forth ending where the big push finally happens in the last episode titled ‘Goodbyeee’. Here are some images and social memes you are welcome to share with friends on Facebook, Tumblr, Reddit, Twitter or wherever you want to use them. Blackadder Goes Forth really was a great series, you can watch clips online but if you want to enjoy it fully again in top-quality you can buy the DVD box-set, money well spent on what is a classic BBC production. There is also a paperback book and you can buy the MP3 theme music. As George said “This is, as they say, it?”, they don’t make TV like this any more! For those of you hoping for a movie it doesn’t seem likely. Richard Curtis has said doing a spin-off is quite unlikely. I’m not sure it would work, so long after the program ended as well. However there is a side of me that still thinks it would be amazing if they did one. For now though, we will all have to stick with rewatching the classic episodes.